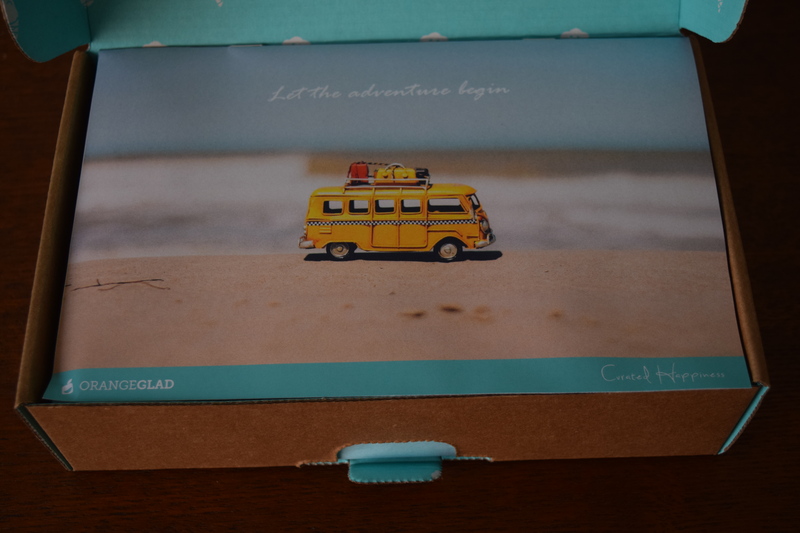 To kick off my last week before I head back to the old/new grind, I thought I’d focus on something sweet with my July review of Orangeglad, a monthly artisan dessert subscription. If you’d like to try out one for yourself use my code ST10 for 10% off your order. About the Company: “’As a currency trader, brokers took us to the most amazing restaurants. It opened up a whole new world for me.’ Cassandra Chen recalls. ‘ I realized that, even though my family’s expectation was that I would stay in my successful professional career, it just wasn’t for me. On a whim, and wearing a skirt and heels, Cassandra walked into Vertigo Restaurant and asked for a job in the kitchen. She w shored on the spot and told to ‘stage’ (kitchen lingo for ‘trail after the cook and work the line’). She had found her calling. Manuel was born to Peruvian/American parents. When he was 22, he worked at the Highlands Bar and Grill, where he learned about gourmet food and fell in love with wine. With Kermit Lynch’s encourage, he moved out to California and worked for josh Jensen at Calera Wines deepening his love for the art of winemaking. Later, under the tutelage of master sommelier Larry Stone, Manuel passed his level 1 exam. In 1997, Cassandra and Manuel’s paths crossed. They were both working for Traci des Jardis at the newly opened restaurant Jardiniere. Through moving on from the restaurant, getting married, and having kids, their love for food never waned. 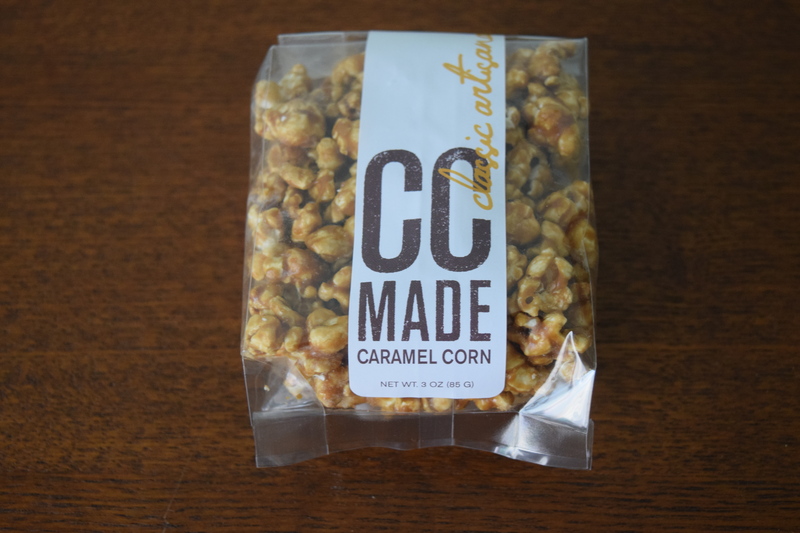 With Cassandra’s experience in the pastry kitchens, they started a line of caramel product and thus CC made was born. 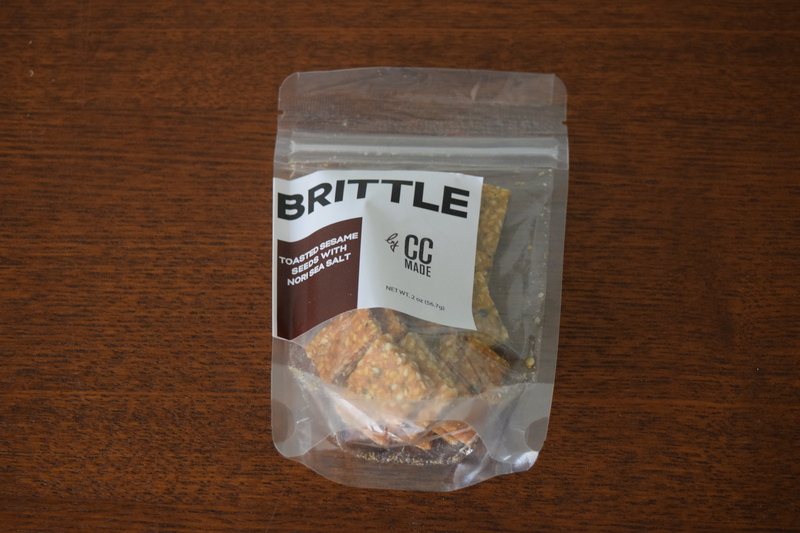 Description: “Roasted organic sesame seeds with bright sea taste of nori and sea salt dusted on top,, this brittle will bring a whole new meaning to reinvented snacks. 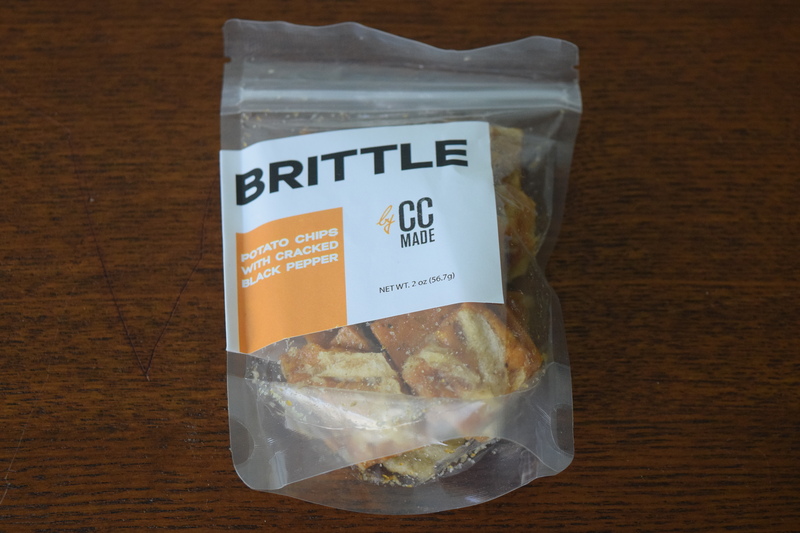 Brittles aren’t really my favorite treats, but this had an appealing flavor that wasn’t overly sweet. The sesame/nori addition made it feel sophisticated. I think it would be an interesting addition to a fruit/cheese/nut dessert plate. The pepper on these treats came through quite clearly and they are much more savory than you’d anticipate in a brittle. I just didn’t like the chip aspect, which is purely subjective. I’m sure someone else would probably love these. Description: “Handcrafted to perfection, Cassandra and Manuel wanted to make something that was hard to find on the market – a really flavorful and quality caramel. What they learned was that to develop a deep rich flavor form the simple ingredients of just sugar and water required an open flame, patience, and perfect timing. 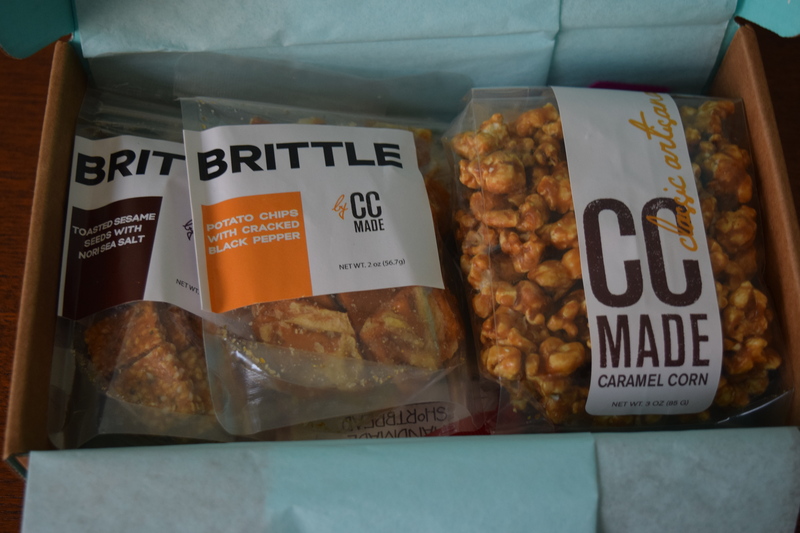 This is the reason why mass manufactured caramels lacked the depth of flavor that they were craving, so they had to create ones that satisfy their standards for gourmet popcorn. I adore caramel popcorn and this one had a lovely, deep caramel flavor and a really nice texture. The caramel wasn’t too thick or thin and the popcorn had a nice crunch. My favorite item in the box! About the Company: “McTavish Shortbread is baked daily in Portland, Oregon using old world techniques and recipes handed down through generations. They use only all natural ingredients with no added preservatives. They are a family owned company that takes pride in producing consistent, high quality melt-in-your-mouth, tastes like your Scottish Grandmother baked it-SHORTBREAD! Their promise is to deliver handmade goodness to cookie lovers everywhere because everyone deserves a really good cookie! This sub *really* loves to include shortbread cookies. Typically, I like them but they aren’t my favorite cookie or dessert and not something I actively seek out. 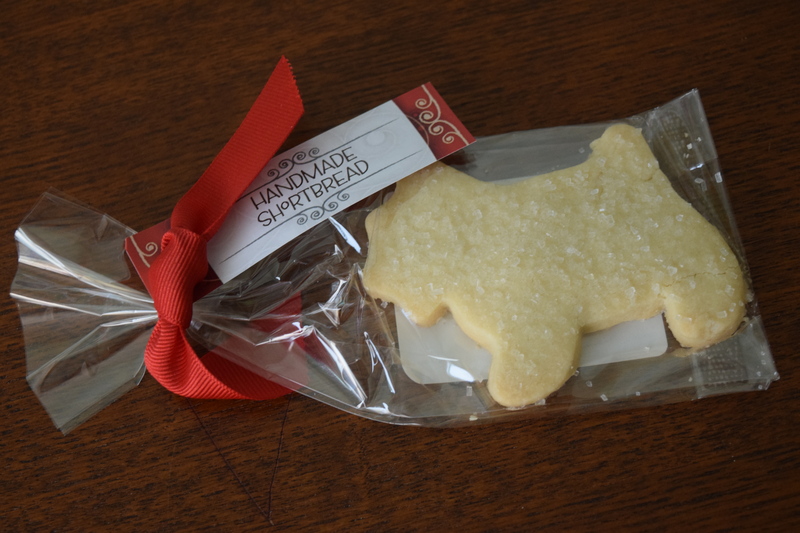 However, these were delicious and probably some of the best shortbread I’ve had. 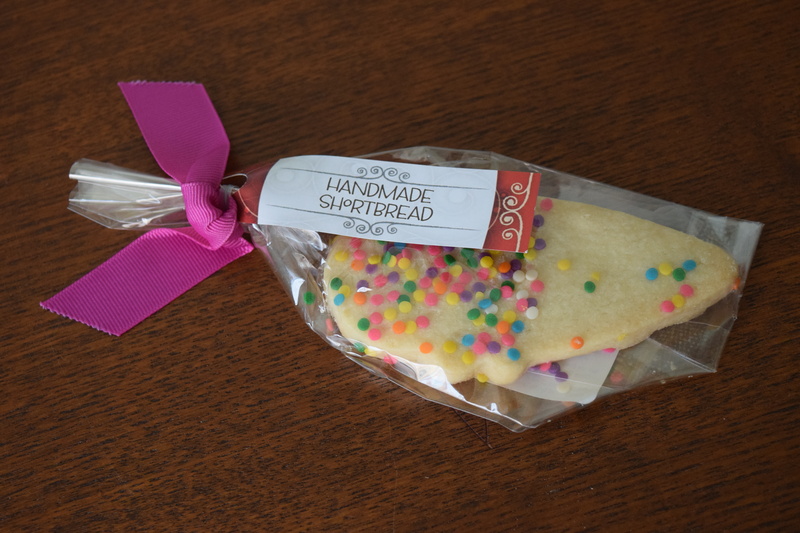 I couldn’t find these exact cookies on the McTavish site, nor can you buy them individually so I estimated the price based on the cost of a dozen of their seasonal shortbread. Let’s start with the good stuff. 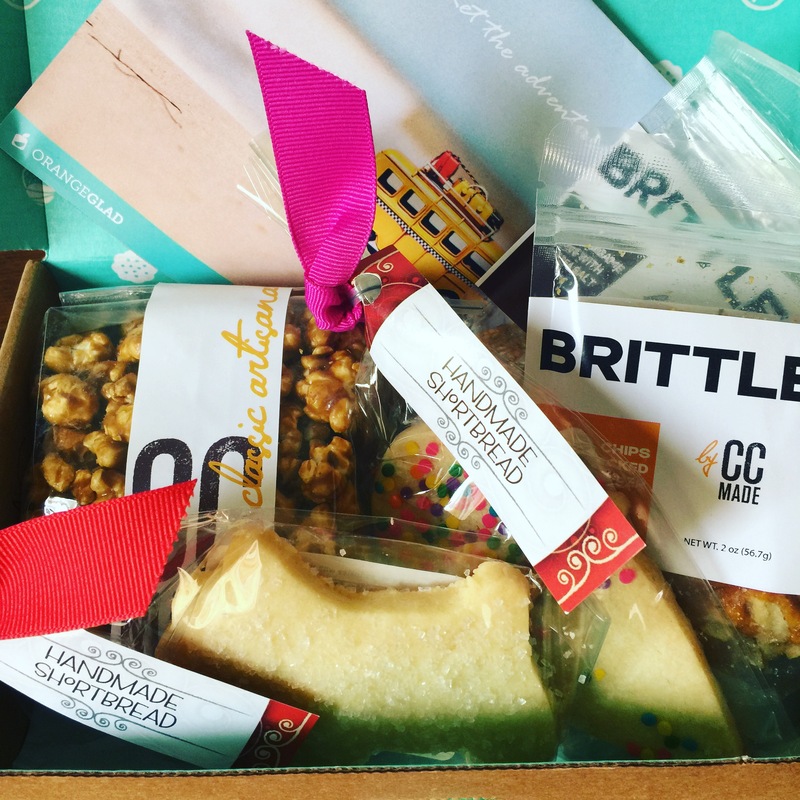 I thought this box was well curated and the treats all felt like sophisticated spins on classics. As usual, they were packed really nicely and even though not everything was to my taste, I could tell they were excellent quality. Now the bad part, the value is just too low for a monthly sub. I receive this box free in order to review it, but if I’d paid for it, it would have cost $25. After doing the math, I come up with an estimated value of only $14.64 for the included items. That includes my estimate on the individual cookies and without shipping and packaging. I appreciate that these treats would be pricey for us to purchase and have shipped individually, but I feel like we need to be closer to the $20 value mark to justify this as a monthly box. Right now, with this price point and value, I’d say that this is a sub more suited for gift giving. It’s great for folks you don’t know super well or who don’t need anything else taking up space in their house. As a gift, paying a little more isn’t quite as daunting as shelling it out every month just for yourself. What type of value do you expect from a sub box versus what you paid for it? Managing your account is easy. If you want a break, you can cancel or skip at anytime, with absolutely no hassle.